A couple weeks back we were discussing potential block plans for Tesla and Edison. We came up with numerous visions, but most of them shared a common thread: the progress made in Tesla has world-changing consequences in Edison. But AlexC hit on something deeper than any one vision in his comment: the best way to elicit emotion from the players is to ensure that the advance turning everything on its head isn't just be something players see; it's be something they build. 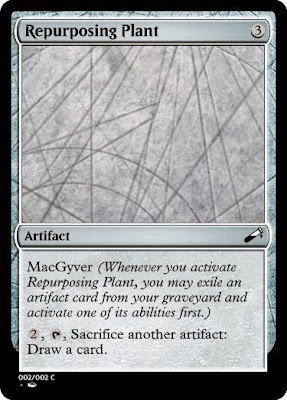 MacGyver offers flashback to your artifacts, but it's closer to Jury-Rig than Unearth. In Tesla it might be a miscellaneous bonus. But in Edison we could give the sense that the machines had started taking over by allowing them to fuel themselves. I'm not in love with that particular execution. It involves weird timing with triggered abilities coming after the cost but before the effect of an activated ability and doesn't give the players as much leeway to be creative as I'd like. Nevertheless, hopefully it's given you some idea of what it is I'm looking for. I can't wait to see your approaches to this challenge. TESLA - "Going Wide with +1/+1 counters and charge counters." I'm on a twobrid kick these days, so take Heatcharged with a grain of salt. Please note, Heatcharged adds up to two counters. Also, HOURGLASS is a symbol meaning the ability can only be activated as a sorcery. T: Add 1 to your mana pool for each permanent you control with a +1/+1 counter on it. Equipped creature gets +1/+0 for each permanent you control with a charge counter on it. HOURGLASS - T: For each permanent you control with a charge counter on it, gain 1 life. When Coaldust Cybord dies, target opponent loses 1 life for each permanent you control with a +1/+1 counter on it. EDISON - "Going Tall with +1/+1 counters and charge counters." I understand the Untap Symbol is like a 10 on the Storm Scale, but it seems like a reasonable small set artifact mechanic. T: Put two charge counters on target artifact you control. HOURGLASS - Put a charge counter on Stun Noded, T: Tap target creature with power less than or equal to the number of charge counters on Stun Node. Lots of interesting stuff here. I see the allure of Interlinked, but I still think it's a mistake to have "charge counters matter" and "+1/+1 counters matter" competing for mind space in Tesla proper. I'd rather just count the number of permanents you control with counters on them (which also adds a bit to their constructed potential due to Planeswalkers). Going along with the more general vision, I could see going from something like Proliferate to something like Modular as a sort of "technological singularity" where all the advances come together. Love the flavour on self-aware. Agree that it needs fleshing out, but I love the switch from "you have to work to use them" to "they're doing all themselves, and that's scary". Technological advances are not merely more efficient or more possibilities. we shan't neglect that tech revolutions also involve (human) cultural and societal revolutions. eg the Matrix was not just a huge virtual world, it was used to enslave humans. Industrial Revolution wasnt just empires of machines and factories. it prompted barons, unions, and entrepreneurs. so perhaps a mechanic that can encompass both natural and artificial components. eg devotion can be expanded to count colorless mana. or a similar function that counts number of X permanents you control. say Capacity of CARDTYPE/CHARACTERISTIC means number of CARDTYPE/CHARACTERISTIC permanents you control. Metalcraft is essentially capacity of artifacts equal or greater than 3. for colored versions, may use COLORS or SUBTYPES of creatures. such that decks of various capacity types vie against each other. in Tesla capacity of artifacts is slightly weaker than colored counterparts. with Edison artifacts turn the tables, and so do the top decks. I have some developmental concerns about a whole block built on a mechanic that makes players reticent to trade creatures, but this is by far the simplest mechanical execution of a big shift that anyone's suggested, so it's definitely worth a look.